This article describes the concept of the Hedgehog Concept by Jim Collins in a practical way. After reading you will understand the definition and basics of this powerful strategy tool. What is the Hedgehog Concept? The Hedgehog Concept by the American business consultant Jim Collins shows how a company or person can be successful in business. It’s about the power of simplicity, increasing the chance of success. In his 2001 book ‘Good to Great‘, Collins describes the similarities between large organisations like multinational corporations and the Hedgehog Concept. Although being successful in business is a complex whole consisting of many interconnected parts, Collins argues that its essence lies in the solid principle to focus and concentrate on one thing at a time. That enables companies to beat their competitors and grow to become successful business. According to Collins it takes an average of about four years to fine-tune the Hedgehog Concept within an organisation. The Hedgehog Concept is based on an ancient Greek parable about the hedgehog and the fox. The fox can do many things at once; it’s aware of its environment, it’s wily, can assess from a distance and comes up with different strategies to catch its prey, the hedgehog. It always ends with the fox being thwarted, having to retreat with its nose full of the hedgehog’s spines. The hedgehog can only do one thing and does it perfectly; it defends itself by curling up into a ball and raise its spines. Collins applies the parable to companies. The people who start large companies and make them successful can be compared to hedgehogs. They focus on one thing. Companies who focus on multiple things at once are the foxes. They can lose focus, which undermines their chance of success. Despite hedgehogs being slow and less smart compared to foxes, they are able to simplify the world around them and focus on a single all-encompassing vision. 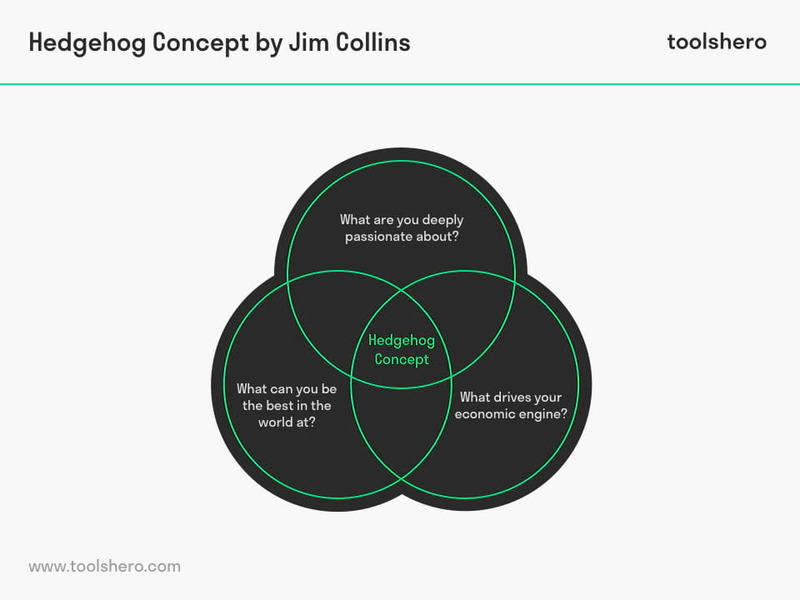 According to Collins, the Hedgehog Concept consists of understanding three circles that each start with a question. The area where the circles overlap is his Hedgehog Concept. Circle 1: What are you deeply passionate about? This is about understanding and finding out everyone’s passion within the organisation. What is truly important to the employees? What work are they most enthusiastic about? What inspires them within the company? What are the organisation’s core values they identify with most? Circle 2: What can you be the best in the world at? Here, it’s about understanding why the organisation is good at what it does. Why is it that the organisation does certain things better than other organisations? The emphasis and focus should be on the organisation’s strengths. It’s not just about core competencies, but also about competencies that haven’t been achieved within the organisation. It’s not a bad thing to have weaknesses; an organisation is allowed to have lower scores in certain areas. Circle 3: What drives your economic engine? An organisation has to be aware what its economic engine is, which is used to generate revenue and profit. What do they earn money with and what leads to economic progress? That insight will make clear what will have the biggest and most lasting effect on the company’s long-term success. Companies have to do more than just follow their passion. After researching the questions from the three circles, the organisation has to determine where they overlap. That overlap is where the Hedgehog Concept can be found; the central vision that supports the organisation’s strategy. By answering the questions from the circles, the organisation becomes more self-aware. They can then translate that self-awareness into a simple concept that can be used as a reference point for taking (important) decisions. That means the Hedgehog Concept isn’t a goal or strategy; it’s about insight and can be a guiding principle for strategic choices. Based on the Hedgehog Concept, it can be beneficial for companies to review their existing strategy and ask themselves if things could be done differently. In order to revise a strategy, it’s a good idea to involve the management team. They have to be told what the Hedgehog Principle means and why it’s important that the organisation bases its strategy on its true passion, talents and economic opportunities. After identifying the Hedgehog Concept, organisations can improve by focusing on what they’re best at, instead of trying to find alternative strategies. What do you think? What is your experience with the Hedgehog Concept / Hedgehog Principle by Jim Collins? Do you recognize the practical explanation or do you have more additions? What are your success factors for making strategic choices? Collins, J. C. (2001). Good to Great. HarperBusiness. Collins, J. C. (2006). Level 5 leadership: The triumph of humility and fierce resolve. Managing Innovation and Change, 234. McGrath, D. M., Conway, F. D., &amp Johnson, S. (2007). The extension hedgehog. Journal of Extension, 45(2).